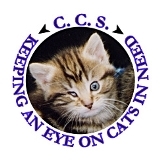 Canterbury Cat Society is a small, independent charity dedicated to cat welfare. It was established over 60 years ago. Since January 1996 cats have been housed in chalets in a garden in North Canterbury. Unfortunately we are no longer able to take cats in but still offer free or low cost neutering. We are able to offer advice to owners of cats with problems. Sadly, there are thousands of homeless cats so we strongly recommend neutering. Neutered cats are far less likely to catch F.I.V. (cat aids) and don't usually roam far.